You’ve all heard the cliche enough times used in international diplomacy: “All options are on the table.” Of course, that’s code for the military option or even the nuclear option. Here, I want to use that metaphor to discuss our current debate about tax policy. Since the previous administration and legislature wrote into law that the “Bush tax cuts” must expire, we’re now faced with the predicament that lots of taxes will be raised amidst an anemic economy if something isn’t done, but if we extend them the deficit problem will be even worse. The locus of the debate or, if you will, the options on the table seem to be that we do nothing and let all the tax cuts expire, extend all the tax cuts, extend all but those for the wealthiest taxpayers, or compromise by extending the tax cuts for only 2 years. The argument for extending all the tax cuts is pretty simple. Raising taxes now during a weak economy is going to make the economy worse, not better. Cato’s Jeff Miron wants to see them extended permanently. Extending the Bush tax cuts — permanently — is a crucial step in restoring economic growth. 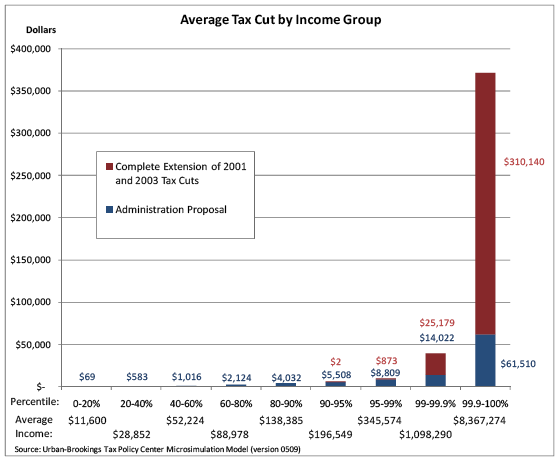 The Bush cuts provided lower taxes on ordinary income, especially for taxpayers at the high end of the income distribution. These are some of the most energetic and productive people in society; raising tax rates would discourage their effort and entrepreneurship. High-income taxpayers also have multiple ways of avoiding high tax rates, so any revenue gain from raising rates would be modest. Alan Viard of AEI likes them all too. The figure shows the increases that will occur in marginal tax rates at the top income levels if the high-income rate reductions (including the dividend tax cut) expire. Beginning in 2011, the top income-tax bracket for wages and self-employment income, and for ordinary investment income, would revert from 35 to 39.6 percent; wages and self-employment income would continue to face an additional 2.9 percent Medicare tax. The top capital-gains tax rate would revert from 15 to 20 percent. Dividends would lose their current 15 percent tax rate and become taxable as ordinary income, subject to the new 39.6 percent rate. All four categories of income would also face a 1.2 percent stealth-tax-rate increase, from the restoration of a provision that phases out itemized deductions at high income levels. Economists left of center like Paul Krugman think that extending the top-rate tax increases is not worth the $700 billion price tag (sounds hypocritical but it’s well reasoned). Now, consider first what would happen if we extend the [high-end] tax cuts for the next 10 years. This would add $700 billion to the debt (pdf). If the rich spread their windfall evenly across the decade, that’s $70 billion a year in additional consumer spending — or $140 billion during the period when we need it. So, $700 billion in deficits for $140 billion in stimulus; not a good bargain! Alternatively, suppose we extend the tax cuts for only 2 years. That’s only $140 billion on the deficit. But the rich, knowing that it’s temporary, won’t spend much of it — if they really operate on a 10-year horizon, they’ll spend only $14 billion a year more, so $28 billion of stimulus when we need it, in return for $140 billion of debt; still a lousy bargain! 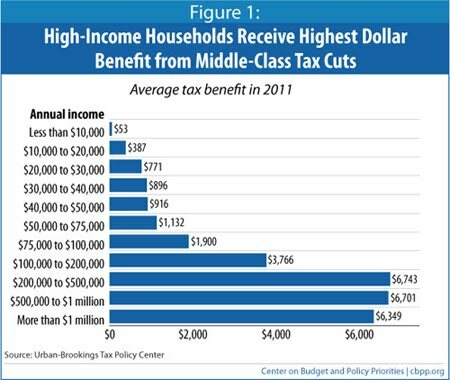 Just for the record, it’s not like the rich wouldn’t get a tax cut under the Democrat’s proposal. That’s because of how marginal tax rates work. For a good discussion on that go here. Most famously President Obama’s former OMB director, Peter Orszag wants to extend all the tax cuts for 2 years, then let them all expire. In a great piece, Bruce Bartlett explains why the Bush tax cuts were inefficient, of little benefit, and harmful to the debt, but acknowledges that during this recession recovery economy it’s probably best we just extend them. I honestly have trouble understanding why we have to extend poorly designed, little bang-for-the-buck tax cuts rather than doing something that could really be a huge boon for the economy. Talk about a game-changer from the Obama Administration! A Democratic administration gets to be the one supporting fundamental and economically productive tax reform while forcing the Republicans (or Democrats), if they vote against it, to be essentially responsible for raising taxes and blocking what a lot of their supporters favor. If Republicans are really worried, rest assured that the tax reform wouldn’t be able to save the economy soon enough to have a dramatic positive effect by the election so the GOP candidates will still have a great chance to pick up a ton of seats – and most likely take the House. Will businesses, conservative intellectuals, and angry tea-partiers (so-called small government types) really be able to support the Republicans ever again if they don’t jump on an opportunity like this? I’ve long touted a VAT as a potential replacement for our absurd tax code. Many mainstream conservatives have even had good things to say about it assuming it was replacing the tax code, not being added on top of it. Here’s a favorite option of progressive policy wonks – something that might appeal to Obama, that I’d be excited to support: the progressive consumption tax. Maybe the Democrats could even slip in some decent energy policy (that they’ve given up on) by raising energy taxes as part of tax reform. Even a flat tax that conservatives have often pushed for would be better than the status quo. Lots of different and better options have to exist rather than being stuck with tinkering with the Bush tax cuts. If the problem is just lack of time, I’m not sympathetic – everyone has known since the Bush tax cuts passed that they were going to expire. It seems difficult to imagine a potentially better time to force lawmakers’ hands to simplify the tax code than now. We’re in desperate need of new revenue, the weak economy could strongly benefit from a more efficient tax code, taxes will automatically rise if nothing is done, and sometimes it takes the people you’d least expect to be able to dramatically shift course. Think of Nixon going to China or Clinton with welfare reform. What Republican wants to be outflanked by a “socialist president” on tax reform? President Obama might be able to drag along enough in his own party to support a tax reform that the business community surely must favor. It seems perverse that such extreme options can be on the table for international relations but are so limited for domestic issues. 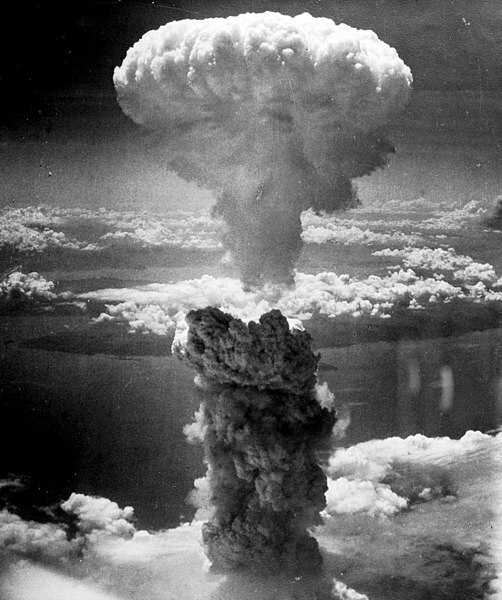 When it comes to tax policy, I welcome the mushroom cloud. The CBO, in their last report on deficits and how to manage them, called for a solution that considered both tax increases and spending cuts. I have yet to hear the Democrats discuss spending cuts. That alarms me to the point where I am going to have to vote Republican this November. We need balance. I certainly agree with need to do something on the tax side and the spending side. I'm just not sure I've heard what the Republicans have said they'd cut. Other than Paul Ryan who I've covered many times on this blog, what have GOP leaders said they support cutting that would make any substantial difference? And for the record, even Paul Ryan's plan gets little to no support. Well, we could start by repealing the health care bill travesty, next we could follow Governor Christie's plan to lay off thousands of state workers, cuts in aid to public schools, and nearly a half-billion dollars less in aid to towns and cities. We all have to learn to make due with less, sadly. Besides its not just about cutting spending, its about preventing further spending, especially to liberal special interest groups who do nothing to grow the economy. Well, I assumed we were talking about the Federal government and its budget problems. But still, even those things you cited won't be enough to even come close to fixing our spending problems. I'm against cutting aid to towns and cities during such a bad economic climate I think that will make things worse not better – you can search throughout this blog to find my views on why austerity is a bad idea right now. Since you cited the CBO, allow me to do the same. I recognize that a lot of this is uncertain and guesswork but the health care bill appears to cut the deficit. Also, as I said, all those things you cited won't be nearly enough – I discuss that further here. I agree that further spending should be checked once we get out of this recession, but keep in mind conservatives aren't a party dedicated to fiscal prudence. Again, I challenge you to find me some national Republican politicians that have said specifically how they'd balance the federal budget other than Paul Ryan (who's plan the GOP leaders have distanced themselves from). Cutting aid to public schools (even if you CUT ALL AID to public schools) wouldn't do it. Cutting taxes also won't do it. If someone thinks cutting taxes is a good idea, fine. But just realize it makes the deficit worse – the two are mutually exclusive. I haven't heard too much about how specifically they'd offset the $700billion in tax cuts for the wealthy for example. The problem with VAT is that we need to take economic action now. Replacing the tax code is not something that can be done quickly given this political environment. We know the GOP plan: cut taxes for the wealthy and try to then cut New Deal programs like Social Security, etc.. Cutting public education funding would be a brain drain to the economic future of this country. The fact of the matter is that having to do with less only affects a certain part of the population, namely the middle class. As Krugman points out: when they say "we" they mean "you". Sacrifice is for the little people. I fear you're right that it may not be the right "political environment" but my question is if not now when? It seems like now might be a possibility – don't let a crisis go to waste and all. It may be a time for some calculated bravery in the policy department. I certainly agree cutting education funding would be a bad idea – and reforms, not thoughtless cuts, are what are necessary to strengthen our entitlements. Thanks for reading/commenting! I'm not opposed to tax increases on the wealthiest earners in America, but I believe that they need to be coupled with spending cuts. Neither you nor anon. have offered any ideaas where cuts should be made. While theoretically spending should get us out of this viscious economic cycle, it hasn't-primarily because of big government/political failure. As far as cutting education, let's face it, the brain drain has actually occured. We spend up to $16,000 per pupil in inner city schools and the results are horrific. Further, public unions (esp.the Teacher's Union) needs to be reigned in if we are to bring those costs down. I'm also for cutting the military/aerospace spending. Medicare and social security need to be reformed as well. I understand Krugman's point and none of these cuts are going to be pleasant, but can we keep heading in the direction we're heading in forever? Oh, and the deficit reductions built into the health care bill are contingent on $600 billion worth of cuts to medicare (the elderly who worked their whole life will now have to "sacrifice" to the indigent).Here's another novel idea to save money-enforce immigration law. It would save healthcare and education budgets huge amounts of money as well as place a relative tax on the rich who will now have to pay workers a decent wage. Don't tell me that no one will do those jobs that illegals do, please. But the Dems do not talk about immigration reform, lest they lose the latino vote. What about doing the right thing in Washington rather than appeal to special interest groups? I thought Obama was going to transcend this? actually the price per student is about the same for public v private. The difference is that private education has more out of pocket expense. Public schools have master level prepared teachers while in private this is not a requirement. Who can afford private schools? namely those with better income. If your child is special needs you can forget private. Thankfully the public education system will accept your child and try to accomodate them. the downside of public education is that they take everyone. Your gifted child gets placed in the same class with the disruptive student. In private schools that kid gets kicked out and sent to the public school. It's interesting that the best scoring public schools are in affluent communities and the ones who score lowest are also low in socioeconomic status. Hmmmm. Maybe something else is at work here? the problem with Pat's favored party is that this is the party who has tried to starve the beast. The party who has never been concerned with balancing the budget. The party whose policies have benefited the wealthiest while allowing poverty rates to grow over the past 30 years. So called Big Gov programs like social security and medicare helped to provide a safety net. What populist small gov proponents seem to have over-looked is that a good government provides the infrastructure needed for healthy economies to thrive. Obama may not be perfect but he did help quell the worst economic crisis since the depression. there is no doubt in my mind that if the GOP were in control, things would be worse. Obamacare will in the end be good for this country. Medicare faced similar resistance in the beginning. Yes, we will need to make hard choices in the future, but not just now. Austerity will kill this anemic economy. VAT and an immigration overhaul are much needed. The funny thing about immigrant workers is that both parties need the latino vote. the difference was that the GOP looked the otherway because business was profiting from the hiring of these workers and the idea that special interest groups are specific to the dems is naive. Like it or not, it's the way a democracy/capitalist society functions. It doesn't appear the elderly will suffer that much (they may benefit) from the passage of this health reform bill. Either way, we're deluding ourselves if we think that we can't reform entitlements and get our budget issues in order. On the spending side, entitlements are the number 1 largest problem – it's not even close. I'm perfectly happy suggesting cuts in spending. In general, controlling costs in the health sector is the biggest thing I support – I think this bill makes a good start, but more needs to be done obviously. Maybe means-testing or raising the retirement age on social security. Also, the defense budget can be pruned down while we should cut back on our military adventurism. I'd also end the war on drugs and regulate and tax them. This becomes difficult because it's not clear if we're talking about what we'd do as a dictator or what we can do in an our political reality. The biggest help would be to just grow the economy and grow our way out of debt. Sadly, the tax side is going to have to be a major part of the equation. We need to expand the tax base and raise more revenue. Of course, I completely disagree with your assessment of immigration. It seems clear that increasing immigration would bring in more tax revenues not less. Immigration is also very beneficial for economic growth. For the record too, Obama has only increased immigration enforcement and done nothing to make it easier for immigrants to legally come here. I'm not happy about that, but I don't understand why conservatives hate it so much. I agree that democrats need say more about what they'd cut specifically – but just pretending that the GOP has is wishful thinking. Their agenda that they just released is all feel good platitudes and will INCREASE the deficit by huge amounts. Meanwhile, the GOP has fought the cost savings measures for healthcare the dems passed, resist any tax increases whatsoever, and ruled out things like cap-and-trade which will also raise revenues. So if the deficit is actually your concern then the democrats have the better track record. And do you really think the GOP won't favor special interests? Please, don't be so naive. That's a bipartisan commitment. Honestly Pat, if Republicans aren't willing to spell out their cuts now when they have a supposedly national movement supporting them into power specifically in order to reduce the size of government, what does that say? Almost everything they support will increase our debt? Where are the hard choices? You started this conversation by saying "I have yet to hear the Democrats discuss spending cuts. That alarms me to the point where I am going to have to vote Republican this November." Well aside from the fact the democrats actually put in a few policies that will cut spending and signaled that they're willing to enact tax side policies that will increase revenue you're right that they haven't talked enough about what they'd do. But the GOP has done less, supported policies when they were in charge that weren't paid for (medicare expansion!) and only promoted policies that make it worse, so how does that scenario make you want to run of the Dems and support the GOP? The Dems might be bad, but what makes you think the GOP is better? Just because they say so? I'm not convinced. Dan- I'll concede and add that neither party is willing to spell out specific measures to cut spending. I went to a large Republican fundraiser last evening with your words in my mind and came away realizing that all I heard were platitudes. However, the week prior, I went to a Democratic fundraiser in CT. and had the opportunity to ask a candidate for State Senate how they planned on balancing the state budget deficit ($800 billion). All I got was platitudes as well. I think some of the frustration with this is being embodied in the tea party. My wish is that the Left had a similar movement in the Democratic party. Move both to the center again. As to immigration, I think I was pretty specific about using the term illegal immigration. I know liberals like to shade the line between the two in order to obscure points, but there is a very real difference. I DO support legal immigration, but illegal immigration, if the liberal want to be taken seriously, need to compromise on this. I believe that illegal immigration is bad for this country on many levels. On immigration I'm going to have to call you out, Pat. First of all everyone realizes that there is a a real difference. Second, and just a quick point, there is every reason to believe that illegal immigrants lead to more tax revenues at less cost than legal immigrants because illegal immigrants can't collect nearly the amount of benefits as a legal citizen. Anyway, if you (and everyone else who claims this) really supported legal immigration but were just against the illegal kind – you support making it easier for immigrants to come here legally (whether through a path to citizenship or a guest worker program or both). THE reason why immigrants come here illegally is because they can't get in legally right now. Feel free to support actual proponents of legal immigration by opening up legal channels for people to come here and I'll support strengthening our detection mechanisms against illegal immigration. To your first point, condoning the exploitation of illegals because they "cost less" is human rights issue and, let's face it, a tax break for the rich. But besides that, while they don't pay into benefits, they certainly sap our healthcare system and our public education system (article 13? ), not to mention public safety costs. As to a path to citizenship, it kills me to support such a measure for those who break laws, while others who do it the legal way get to the end of the line. Support stiffer laws that punish those who hire illegals, support the enforcement of laws like that developed in Arizona, and I would consider supporting a path to citizenship. When did I condone their exploitation? haha. I want to give them a legal channel, either a guest-worker program or a path to citizenship precisely so they won't be exploited. How is it humane to force them and their families to live in terrible poverty in a country they happened to be born in just by genetic luck? Also, they do pay into benefits. They buy things (sales tax) and pay into social security (but can't collect) for example. Either way, I'm not arguing for illegal immigration – i want to make it legal to come here, so this argument is a tangent. Many industries have labor shortages that could benefit from hiring willing workers (that includes low and high skilled workers). For the path to citizenship you can make them "get to the back of the line" as they say – if you're worried about "rewarding" them. For the record, I don't hold such hostile feelings to people just trying to better their own lives – but to each his own. The McCain-Kennedy bill did exactly what you were talking about – increased enforcement and created a pathway. But that wasn't good enough: most conservatives just don't want immigration of any kind. You should at least be supporting a guest-worker program, which worked very well in the past. Feel free to watch that video I posted on immigration in the post below.